Child safety is one of the most important things you can do for your child as a parent. YES some of these things WILL cost you money BUT that is what you need to do to protect your child. Most of what you will do is educate and that my friends only takes one thing…TIME. Unfortunately not all children understand right from wrong and at a young age it’s even more important that parents watch over their children at all times. Most accidents occur when our backs are turned or when we least expect it. Accidents in the home can cause serious injury including death. It’s not only in your home either but wherever the child goes. Yesterday 3 year-old baby Elijah Marsh in Toronto lost his life when he wandered out of his grandparents apartment. I think most of Canada came to a stand-still with the news because we were praying that he would be found alive. Baby Elijah had no hope once he walked out the complex door and disappeared into the night unless someone was watching over him from above or someone spotted him. The cold streets that night were around -15C and here was this baby boy wandering the streets on a mission of his own. My wife hasn’t stopped talking about baby Elijah because it really gave her a heavy heart as a new mom. Many times when she talks about it I can hear the quivers in her voice as if she wants to cry. Two days have passed now and she still talks about it. When we were young my parents never had any concerns with us kids leaving our home. At least not that I am aware of although I’m sure they were concerned for our safety at all times. We never did. Baby Elijah was just one of those situation where something happened when it was least expected. How far should parents have to go in order to protect their children? My answer… As far as you think you need to go if it will save their life. No one can tell us what to do in terms of parenting (unless of course it’s illegal) but in the end we are left to deal with the consequences. If we did everything in our power to prevent something from happening than at least we know that we did our part. Although it was only an accident It’s so hard watching him standing in the doorway just about to leave the building on the surveillance footage. “I don’t know how many times I said, turn around.. don’t go baby Elijah”, said Mrs. CBB. She’s probably not the only one. I do know that if we go to the trouble to baby proof our own home that we should NEVER risk our child in someone else’s home unless it’s just as safe. Overprotective…maybe but he’s our baby boy. You might have to go to work and your in-house babysitter called in sick so you need to find someone to watch your child. The only person who can watch your child is a neighbour but their house is not baby proofed. Do you call in sick and lose pay or stay home and watch your child and tell your employer the truth? Consider the potential consequences if something were to happen. When you send your child to daycare do you make sure that your child is getting the best possible care and the premises is safe and secure? Sure you do so it’s no different in your own home or wherever you leave your child. A simple $15.00 chain lock high up out of a child’s reach may prevent him/her from leaving the home. A door alarm is another option and could save a life. What would be great was if there was an alarm you could attach to any door and take with you wherever you bring your child. Maybe there is and I just don’t know about it yet. It’s easy enough to bring along door locks for kitchen cupboards if you needed to supply someone who was watching your child but the door lock may be tricky. The take-along door alarm would certainly add some safety value and peace of mind. One comment from a reader that I read online pertaining to a news article of missing baby Elijah said that adding the chain lock would work but what happens when there is a fire and the child can’t get out and dies? Not that the child will be left alone but what if they were near the locked exit and that was the only way out during a fire? These are situations where you try to protect but other issues can crop up that interfere with something you are doing to protect someone in the first place. I like the alarm because I can’t sleep through a smoke alarm going off in the house so the door alarm would certainly awaken me. That option would at least allow the child to get out of the house in the event of a fire as well because the chain lock would not stop them. That’s your decision because it’s your child. There is no law stating you have to child proof your home that I’m aware of yet but we all know that for the small amount of money that it would cost you, it’s worth it. As new parents Mrs. CBB and I spent quite a bit of time doing our research online and talking to professionals about how we can child proof our home and overall child safety. It wasn’t just our home that we talked to the professionals about we also wanted to learn about safety outside of the home. We made sure to buy baby gates and to put away anything that our baby could grab and pull off of tables. There’s so much more we will have to do but we are learning to do this before he is mobile. No, you can’t keep your child in a safety bubble BUT you should at least protect them with every ounce of love that you’ve got for them. They deserve that much so don’t get lazy and think it won’t happen because the minute you do that’s when something might happen. Child safety is so important and although this list I’ve created below only scratches the child safety surface we will protect our own child any way we can. Keep in mind these all happen at different stages in growth. How to install a car seat, best car seat to buy, car seat ratings, car seat expiration dates, car seats and accidents, what you can and can’t re-sell at a garage sale or online. We were actually pulled over by the local police who checked our car seat to make sure it was installed correctly. I was a bit nervous because I was the one who installed it so I was hoping I didn’t mess anything up. I was confident though because if I wasn’t I would have had someone inspect the car seat. There was something that needed to be fixed and we had to do it immediately. The car seat was too low so I had to put a rolled town or a pool noodle in the front of it to lift it back a bit. Now that he’s gotten bigger that is not necessary so it’s been removed. If you aren’t sure call your local police station to see if they have any qualified car seat installation experts or see if you can find one to inspect your installation job. We hare about kids going to websites they shouldn’t be or finding themselves talking to strangers. It’s important to teach and know how to protect your kids from those strangers that lurk behind the screen. Once you learn as a parent you can explain to your child about internet safety and what they can and can’t do while on the internet. You can also block and monitor what they do online. In the summer there are sports, parties, family gatherings, holidays, day trips, pools, beaches (water safety). Preventing injury by going over safety rules for each event may save a life. Swimming lessons go a long way for water fun and something we plan to do with our son at the local YMCA. If your child has an allergy make sure the appropriate people know but most of all make sure your child knows what they can and cannot eat. Teach them about options and what might happen if they eat something they are allergic to. Teach your children how to react in the event of a fire inside the home. Make sure your child knows how to call 911 and what it is. Teach your child their home address and phone number as well as their last name. Do they know what city they live in? Do you have a fire extinguisher and working smoke and Carbon Monoxide detectors? I’m sure if you aren’t sure what to do if you call your local fire department they would be more than happy to go over fire safety rules with your family. Kitchen safety for kids as well as bathroom safety are two popular rooms to baby proof. Keep all chemicals, products and prescriptions that can harm your child far out of their reach or locked up. When I went out to play as a child my parents knew exactly where I was and I knew what time I was supposed to be home and I came home.Make sure your child knows what time dinner is at and the time they need to be inside for the night. Not talking to strangers and not going places without letting you know or the people who are caring for them while away from the home is important as well. I don’t know if every school has certain protocol when it comes to child safety and parents but I’m sure I will find out soon enough. I have heard that many parents share a “safe word” with their child. It’s a word that tells the child that what they are doing is going to be safe or if someone is picking them up they don’t go with them unless they know the safe word. Kids are naive so teaching them not to get into a vehicle unless an authority figure like a teacher or principle is aware or has told them it’s safe. Even family members or close friends have managed to kidnap kids so take all precautions so that your child understands. If someone is going to pick them up let the child know before they leave for school or find a way to contact them to let them know. I’m not sure if calling the school to say a child will be picked up by someone else is normal practice. How do they know who you are on the other end of the phone? Maybe they have parent safe words too! Also teaching children never to accept food or drink from strangers may squash any attempt to lure them away from their safe path or space. Take every precaution to child proof all of your electrical outlets in the home. We bought a kit that cost us about $10.00 and we can plug the outlets so nothing like keys get shoved inside. Teach your child how to use the cross-walk and how to cross with or without a crossing guard. What happens when the traffic lights are out? They should know how to handle crossing when traffic is at a stand-still or there are traffic light issues. This is important in order to keep them safe on the playground equipment while teaching them about not talking to strangers and where to go for help. It’s important for your child to keep their shoes on while at the playground and practice safe playing. Many kids have been injured or died at a playground because of unsafe playing or accidents that could have been avoided. Teach your child not to touch any type of needles or other garbage that might be lying around as it should be considered dangerous. There is no need to touch it anyways. Give them a safe word. What else we should add to this list and what you feel is important or has worked for you. As new parents we want to learn so please share your insight and experiences in the comment section of this post. This is not meant to tell parents what to do rather it’s more about what we plan to do with our child. I also wrote it to remind parents about child safety and to never let it slip to the side because you run out of time or think you have no options. If you aren’t sure where to start there are people who are professional child proofers and will help you keep a safe home environment for your child. If you live in the Toronto or GTA and don’t have time or knowledge about childproofing check out Child Proofzone who specialize in child safety. Sure, you will have to pay for this service but isn’t your child worth that? What steps have you done to baby proof your home and protect your child when left in the care of others? How much did you spend? It’s funny how my week just seems to fly by these days. Even on my day off it feels like I’m not getting any rest as I’m running around all day. That being said I have some good news. I will have 2 days off a week starting in March which will help me get a start on what I need to finish up in this house. It was hard to say no to full-time hours because the money is amazing but I just can’t do 2 full-time jobs, blog and be a husband and dad. Baby is teething now which has been hard on the both of us as he’s not doing the best. We have tried everything we can for him so hopefully they hurry the heck up so he can enjoy being a baby boy. This week we were able to score a nice load of children’s books starting with baby up to age 3 as well a few toys. Baby CBB loves his new to him CAT dump truck, racing car. I’m happy about it but just want to let those people know who share my posts, thank-you. I take so much time to write these that I appreciate that time you take to share it. What would you do with $100,000 in savings? I thought it would be fun to share the Top 5 pages and posts each week for those of you that are new reading Canadian Budget Binder. I have an amazing deal I want to share with all of you today. My husband went into the city today with my little one and when they were at London Drugs he found the Weetabix was on sale for $0.99 each. He bought a whole box! 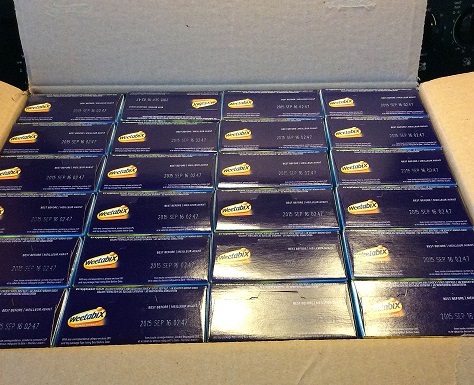 When I was putting them away I notice a $1 off coupons on them all for 400g boxes bug score they are usually $4.99. We saved quite a bit of money on cereal our entire family loves. This is my way of giving back to the personal finance community through networking and sharing knowledge with my fans. Today I’d like to welcome Janeen from Loving Little$. Hi! I’m Janeen. I encourage families on their financial journey at Loving Little$. I’ll confess straight away that I’m a bit of an idealist. You see, I have this crazy idea that families who manage finances wisely will affect their communities to think carefully about money too. I believe that communities who understand the importance of stewarding their resources will in turn influence governments to exercise the same diligence. See, I told you I was crazy! The goal of Loving Littles is to change the world one financially fit family at a time. My own financial journey began when I experienced the independence of college as a teenager. I’m thankful to have grown up with parents who were conservative with money. They taught me that money only comes with work. My folks also taught me the importance of giving. My siblings and I were presented with a clear example of generosity as they joyfully and repeatedly gave of their time and money. I was married after my first year of college and jumped headfirst into managing our finances. It was both fun and scary, as we had a small income and needed to carefully budget our expenses. We knew enough to stay away from credit card or car loan debt, but we shortly found ourselves in a large mortgage. It wasn’t until we signed on that mortgage note that I really understood what debt felt like. You know what? Taking on that large loan didn’t feel good at all. Fast forward a few years and we finally had our debt epiphany. We realized that we didn’t have to live with a mortgage! Even something as mundane and “ordinary” as a home loan didn’t need to be a part of our lives. We committed to paying down our mortgage as fast as we could. We’re on track to pay that debt off by December of 2018. We’re excited that our family (now including 5 “littles”) will be able to live life in an extraordinary way. It’s thrilling to partner with other families as we share our financial experiences together. Join us on our adventure and share your own financial journey at Loving Little$. When I saw this photo for a Triple Chocolate Cheesecake with an Oreo base I nearly fell off my seat. I am a lover of chocolate so when I found the website OMG Chocolate Desserts I felt right at home. You have to check out this recipe and website especially if you love chocolate as much a I do. 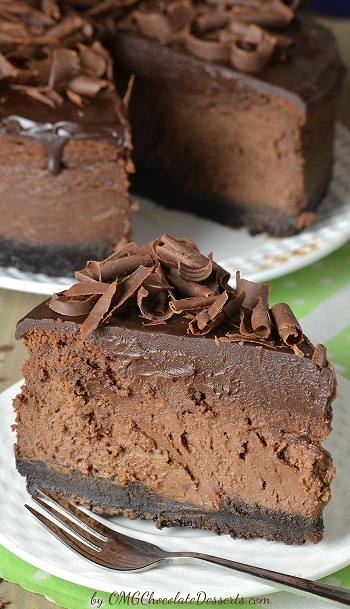 This chocolate cheesecake looks so creamy and loaded with delicious chocolate. Making a cheesecake is not as expensive as you think it is at home compared to buying it from the grocery store or a bakery. Unless you are in a rush to get the ingredients wait until the cream cheese is on sale and stockpile the chocolate when you find a bargain. Even if you had to pay full price for the products I’m betting you would still save yourself a bundle. Have you seen the price of a large cheesecake this size at a bakery? Be prepared to pay upwards of $35 plus dollars for a small one. Editor’s blog post pick of the week goes to Alan over at the Canadian Personal Finance Blog. He really hit home with his blog post this week about Bill Notification Overload. I agree with him that it used to be easy. We would go to the post get our mail then pay the bills at the bank. NOW… we can opt for paperless bills, paying online, e-post etc. Alan says he missed payments because of this and I don’t blame him with the mish-mash of billing opportunities we are faced with today. Thanks for the great read Alan! Is it easy to get OSAP?- Not really and just as difficult to pay it back for those who get it. Who will give me a loan for an RRSP loan while I’m in consumer protection: Hmm… no one! The Saturday Weekend Review #105: Are low gas prices seducing you to buy a new vehicle? The Saturday Weekend Review #106: Should you be sent a bill if you are a party no-show? The Saturday Weekend Review #107: Would you buy a $140 Super Pizza for Super Bowl? The Saturday Weekend Review #108: Did you go overboard for your wedding day? Oh, my heart breaks about baby Elijah. 🙁 We were a young parent as well, but as much as we can, we will protect our only daughter from harm. Such a sad story about the little boy in Toronto. He would have been tall enough to just reach the chain on the door in the apartment too. In the scene you asked about I’d likely invite the neighbor to look after the child in my home… I babysat the grandson quite a bit when he was younger and it was normally at their apartment. A registered daycare has rules and such about things and they must follow the regulations set out by the provincial government, not doing so can cost them their license. It used to be the Ontario Daycare Act, not sure what they call it now but the rules they must follow are there. They are inspected regularly and heaven help them if they don’t pass.If something happens to a child at the daycare the staff must fill out an occurence report. My daughter works at a daycare. If a child gets sick, the parents are called. No body can pick your child up unless they are on a list of people provided by the parents. Schools as well. I have picked the grandson up at his daycare back when he was quite young and I have picked him up at school. My daughter had to let them know what would happen and I had to show ID and sign a sheet of paper that I was taking him with consent. If you have questions about if a car seat is installed correctly you can check with the police or you can get hold of your local public health unit about car seat clinics which are usually free of charge. If the PHU doesn’t do the seat checks they can tell you where to get it done. Don’t ever let your guard down around water with your boy… Swimming lessons for the young ones are no substitute for an alert parent. We kept our computer in plain sight when the kids were younger. It didn’t go into their bedroom until they were old enough to pay for their own. Schools here in Ontario have a zero tolerance to any kind of violence these days but they do have to hear about an issue to do anything about it. All we can do as parents is to do our best and try to keep our children safe, it’s not always enough as Little Elijah has shown. Give your boy a hug for us…. Nicola and her hubby got a sweet deal with the cereal there!! Have a good weekend there Mr CBB!!! I know my wife and I were deeply touched by this story and can’t even imagine the pain this family fees. It seems the more I write about my own problems with money, the more I strike a chord with folks, maybe I need to go in that direction more. Thanks for the inclusion, the story of the little boy almost crushes your soul, but remember the first responders as well, and the unfortunate officers who found the little lad, their lives are now changed forever as well. My prayers go out to the family and to all touched by this tragedy.